You could argue that his experiences alone could fit multiple lifetimes. Just as he did not allow life to get in his way before, David is not allowing his eyesight to get in his way now. TAMPA -- David Townsend has had quite the life. You could argue his experiences alone could fit multiple lifetimes. Just as he did not allow life to get in his way before, David is not allowing his eyesight to get in his way now. The retired dentist and Coast Guard veteran has been dealing with failing eyesight for the last seven years of his life. Originally he could not understand why. He suspected that a tick bite might have something to do with his vision issues, but he didn't get medical answers from doctors until his diagnosis of iritis. Iritis causes inflammation of the iris, which can be caused by Lyme disease. His biggest concern with his vision impairment was his wife. "My wife is outgoing and social, and I know she didn't like to leave me alone so she wouldn't do the things she liked to do," David said. That's where David's daughter stepped in and suggested that he get a guide dog. He was soon matched with Harley, a beautiful black lab. "Harley is like an extra son," David said. And the name couldn't be more fitting for his sight-seeing dog, either. 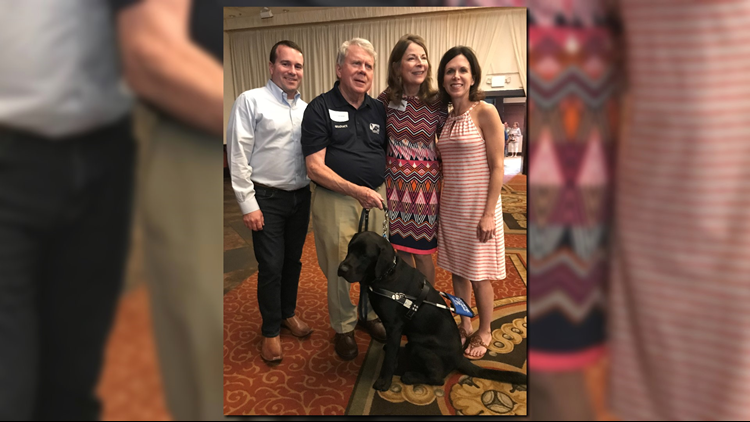 David is an avid Harley-Davidson rider so Southeastern Guide Dog commencement speaker, Suzy Wilburn, added that during the commencement ceremony, "When he learned Harley's name, I asked him a simple question - David, are you going to call your friends and tell them about your new Harley? And are you going to let them try to talk you out of it?" Suzy had plenty to say about David during the commencement, but of course, David stole the show with his speech. Harley provided so much for David, but also reassured him of his biggest concern. After being married for 40 years, David is focused on making his wife's dreams come true, which Harley has helped make possible for the couple. Thank you for your service, David, and best wishes to you and Harley!